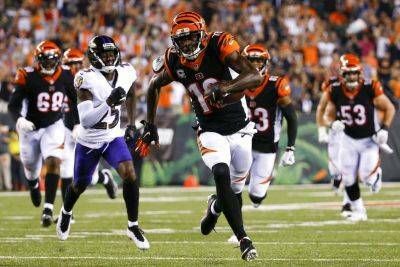 CINCINNATI — Andy Dalton kept the Ravens out of the playoffs last year by throwing a long touchdown pass. He sent them to another loss on Thursday night by throwing four more, getting the best of a defense that has bedeviled him for much of his career. Green set the tone with touchdown catches of 4, 28 and 7 yards on consecutive possessions, a career high . Upset that he fumbled twice during a 34-23 win at Indianapolis on Sunday, he caught everything near him during the Bengals’ early surge. Green finished with five catches for 69 yards. The Ravens switched up their coverage on Green but couldn’t stop him in the opening half. “We did all that and he still made some great plays,” coach John Harbaugh said. Dalton’s 14-yard touchdown throw to Boyd made it 28-7 late in the first half. Joe Flacco was sharp in an opening 47-3 win over the Bills, but couldn’t do anything against Cincinnati until the Bengals led by three touchdowns. Flacco threw a pair of touchdown passes , including a 21-yarder to John Brown that cut it to 28-23 with 9:35 left. “You better bounce back quick on a Thursday night and we didn’t do it quick enough tonight,” Flacco said. The Bengals honored their 1988 Super Bowl team at halftime, their last team to go deep into the playoffs. They haven’t won a playoff game since the 1990 season, the sixth-longest drought in NFL history. The Ravens had their streak of five straight Thursday night wins snapped. The Bengals are 6-14 in prime-time games since Dalton’s rookie season of 2011 — 0-5 on Sunday night, 2-5 on Monday night, 4-3 on Thursday night and 0-1 on Saturday night. The Bengals are 2-0 for the first time since 2015, when they won the division, and for only the fifth time during coach Marvin Lewis’ 16 seasons. They’re the first team to score at least 34 points in each of their first two games since the 2013 Broncos, who reached the Super Bowl, according to ESPN Stats & Info. Bengals: Preston Brown was inactive with an injured right ankle, leaving Cincinnati without two top linebackers. Vontaze Burfict is suspended for the first four games for violating the NFL’s policy on performance-enhancing substances. … DE Michael Johnson hurt his left knee in the first quarter and didn’t return. … Rookie C Billy Price hurt his right ankle in the first quarter and didn’t return.